CINCINNATI – Scientists may be on the road to solving the mystery of a group of mostly incurable blood diseases called myelodysplastic syndromes (MDS), which cause people to have immature, malfunctioning bone marrow cells that fuel a diverse set of health problems and can lead to leukemia. MDS is linked to a number of different gene mutations and considered one of the most complex malignancies affecting blood-making hematopoietic stem cells in bone marrow, according to Gang Huang, PhD, a cancer biologist at Cincinnati Children's Hospital Medical Center. He is lead investigator of a new study in the journal Cancer Discovery. It identifies a gene that in laboratory experiments fuels the biological processes that cause the different types of MDS that physicians see in patients. "We know the genomes of MDS patients have recurrent mutations in different transcriptional, epigenetic and metabolic regulators, but the incidence of these mutations does not directly correspond to the disease when it occurs," said Huang, a member of the divisions of Pathology and Experimental Hematology and Cancer Biology. "Our study shows that malfunctions in the signaling of HIF1A could be generating the diverse medical problems doctors see in MDS patients." MDS is becoming more prevalent as the population ages, with the median age of occurrence at about 70 years, according to the researchers. The only curative therapy is a bone marrow transplant, but it's only appropriate in a rare number of cases, one reason being that older patients who get MDS are not healthy enough to tolerate hematopoietic stem cells transplantation. HIF1A (hypoxia-inducible factor 1 alpha) is a transcription factor, a regulatory gene that tells other genes what do to. HIF1A plays a vital role in how cells respond to metabolic changes and oxygen, and it affects the function of more than a thousand genes. 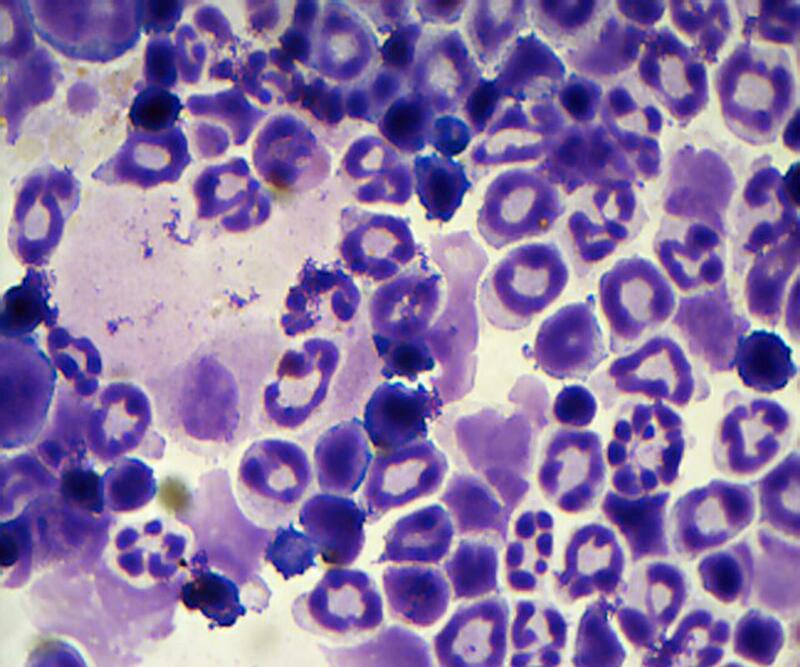 This includes a vital role in regulating biological functions in blood-cell-making hematopoietic stem cells in bone marrow. Huang and his colleagues identified HIF1A's central role first by studying donated cells from MDS patients. This included extensive analysis of the cells' transcriptome (a complete list of messenger RNA molecules expressed from the genes in an organism) and epigenome (the collection of chemicals that help regulate genes in cells). The scientists found evidence of dysregulated HIF1A in the patient cells. This led to experiments in different genetic mouse models to study the onset of MDS and its genetic and molecular drivers. These tests confirmed that dysregulation of HIF1A has a central role in the onset, including different manifestations and symptoms found in patients. Although the authors stress that years of additional research are needed before knowing if their findings will become clinically relevant, their study does point to HIF1A as a potential therapeutic target for a disease that needs new and improved therapeutic options. They determined this by genetically and chemically eliminating HIF1A signaling from their genetic mouse models of MDS. The scientists report that inhibiting HIF1A reversed a broad spectrum of MDS symptoms. Huang said the next challenge for researchers is to identify an HIF1A-specific therapeutic agent for treating MDS. Currently, most small-molecule inhibitors of HIF1A target both it and a second related molecule called HIF2A, which would make them unsuitable for MDS patients. Funding support for the study came in part from the Kyoto University Foundation, the MDS Foundation, the Cincinnati Children's Hospital Research Foundation, the Leukemia Research Foundation, OCRA, the National Institutes of Health (R01CA166835, R01DK105014, P50CA140158, R01CA89341, National Natural Science Funds of China (Nos. 81470338, 81370611, 81300392, 81470297, 81770129, 81530008, 81470295), Tianjin science and technology projects (13CYBJC42400), a Cincinnati Children's Research and Development Project through the Cystic Fibrosis Foundation, the Ministry of Science and Technology, Taiwan (MOST 103-2321-B-182-015 ).